Carlisle United boss John Ward has released three players following their defeat in the League One play-offs. Zigor Aranalde, Paul Arnison and Grant Carson have all been let go and Kevin Gall, who has another year left on his contract, is available on a free. Midfielders Luke Joyce and Grant Smith will be offered new contracts. Talks with first-choice goalkeeper Kieren Westwood are still ongoing, while youngster Dan Wordsworth has been offered a one-year deal. 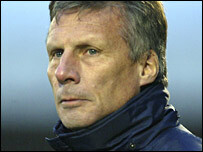 Carlisle boss John Ward told the club's website: "Zigor has been a fantastic servant for the club. But we sat down and looked at the situation, and he's 35 now. "Young Evan Horwood has come in and done a great job, and we also want to push Darren Campion on as a left back, so there just wouldn't be the opportunity there for him to play. "I also couldn't offer Paul Arnison guaranteed first-team football, as we feel that Dave Raven is in front of him, so we have made that decision in the hope that Arnie will find a club where he will feature regularly. "Again, he has been an excellent servant for us. He is a real livewire, one of our noisy lads, and he's a bright person to have around the place, not just on the pitch but in the dressing room as well. We will miss him, but we've had to make a football decision. Ward feels there is no room for Carson as Kieren Westwood and Chris Howarth have held their own. "Grant Carson hasn't featured for us and we feel that we have the cover we need in that position," added Ward. "Obviously Keiren has done really well, and Chris Howarth is also pushing him all the way. "Young Alex Mitchell, although he is only 16, is coming on in leaps and bounds, and we have high hopes for him, so I decided that I couldn't really carry four keepers on the staff. "Alex is still playing youth football, but that would still leave me with three senior keepers." "Kev Gall has a year left on his contract and his opportunities were limited this season. "He's been out on loan to Darlington, and been over to Canada, and that didn't happen for him. It's become a case of us having an experienced player who desperately wants to play. "I couldn't offer him that at the moment, so we have made him available and we can see what interest there may be."